Before arriving in Paris in October, I’d heard quite a bit about the newly opened digital art museum, L’Ateliers des Lumières, and so it was definitely high on my list of places to visit. Once we arrived, my traveling companions, Thom and Eric, and I went online to check it out. We noticed right away that weekends were sold out. We also realized that it would be best to book in advance, purchasing our tickets online to avoid the potentially long lines waiting to buy tickets onsite. Digital art has been appearing with more frequency in the past few years. From November 2017 to April 2018, the Tate Modern presented the Modigliani exhibit. In addition to 100 of Amedeo Modigliani’s iconic portraits, nudes and sculptures, the Tate paired the exhibition with The Ochre Atelier, a Virtual Reality tour of the artist’s studio in Paris. The seated experience enabled visitors to listen to narrated accounts from the artist’s friends and Tate’s experts while exploring the more than 60 objects authentically modeled by 3D artists. However, the digital art museum or, in the case of Paris, ‘workshop,’ which is the direct translation of atelier, is a fairly new concept. L’Ateliers des Lumières, located in the 11th Arr., opened in April 2018 with three presentations: Gustav Klimt, Hundertwasser and the contemporary installation, Poetic_AI. Klimt artwork as it unfolds as digital art. Along with our Parisian friend, Sandrine, who met us at our flat on a beautiful, warm Wednesday, we walk the short distance to the museum to arrive by our 12:30 entry time. There were two long lines, one for those with tickets and the other, much longer line, for those wishing to purchase them. Sandrine mentioned that it was good that we had our tickets as she read that the 12:30 exposition was complet (full). We enter the building quickly and move through the ticketing area. With my phone in hand, I scan the ticket codes for each of us and we move through the turnstile. The museum is operated by Culturespaces, a French museum foundation specializing in immersive art displays, and housed in a former foundry. The Chemin-Vert foundry dates to 1835, when it was established by the Plichon brothers to make high quality cast iron parts for the railroad and the navy. The family-owned foundry closed in 1929, and was purchased by the Martin family in 1935. The foundry was used to manufacture machine tools until the Martins’ moved their company in 2000. In 2013, on the heels of the successful opening of the Carrières de Lumières in Les Baux de Provence, the president of Culturespaces discovered the unoccupied foundry. The Martin family was enthusiastic about the concept of creating a center for digital art in Paris, and agreed to rent the space. Carrières presentation of 16th century artists: Bosch, Brueghel and Arcimboldo. As we enter the main hall of the exhibit, we find a concrete floor on which many people are sitting around its edges. We walk to the center and looking to the right, we can see around a corner, and to the left at the far end, there’s a stairway with a viewing platform partway up the wall. There’s a large round column off to one side. The ceiling appears to be about 25 feet high. An example of the Poetic_AI presentation. This presentation ends and the lights come up, but remain dim. The Gustav Klimt presentation begins as we walk around to experience another view. I’ve always been rather enthralled with this Austrian artist who seemed to combine surrealism and realism with the beauty of art nouveau in his gilded portraits of women. The images flowing across the canvas of this foundry are enthralling. As the shapes draw themselves out, they appear to come alive, all while pulling you into the midst of the painting as if you belonged there. The colors are bright and bold, the golds and yellows reflecting like a sunburst. These images are put into motion by 140 laser projectors. One would think the use of this digital medium of algorithms and mensuration would appear a bit discordant, but the beauty and awe are captivating, drawing us into the artists’ universe and immersing us in this fantastical aesthetic experience. The final Hundertwasser presentation does not disappoint. 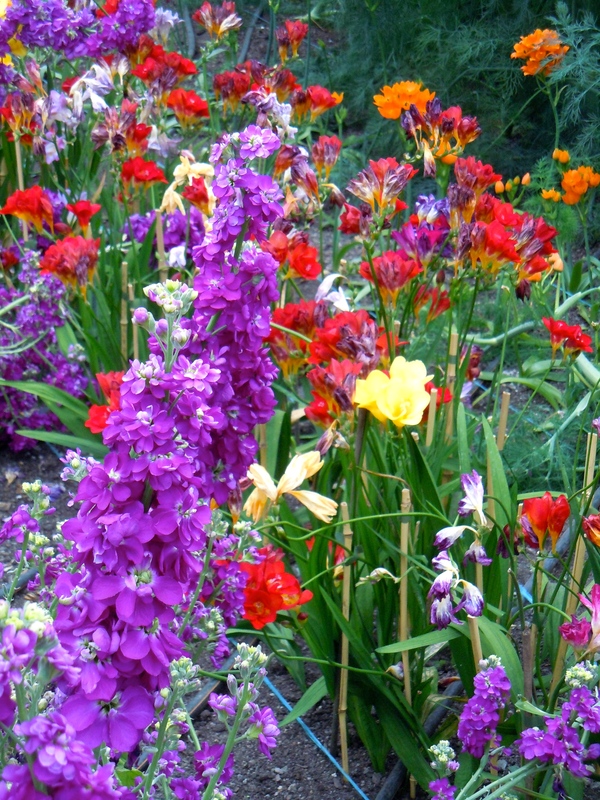 Its beautiful bold colors and shapes draw gardens of superior beauty and gracefulness. The experience is one where you could stand, walk or sit at various places throughout the building and see changes in the shapes and flow of the images. It’s at once, calming and emotional. After our visit to the Ateliers des Lumières, I was sharing my experience with some friends, and one suggested I check out the new digital art museum in Tokyo by teamLab*Borderless. I checked their website and agree that it would definitely be worth the trip. This new type of museum is inspiring and reaches an entirely new generation of artists. As it expands to other countries, it will be fascinating to see where it leads. “Oh, fine,” I said, reluctantly. It’s a memoir, you see, and not my typical cup of tea. Nonetheless, I grabbed the copy from the bookshop shelf and took it home, where it sat for several weeks. I began to imagine the tiny hare on the cover staring at me reproachfully each time I passed. The hare with amber eyes netsuke. When I finally picked it up and began, I found that my book connoisseur friend was correct — it was well written and extremely engaging. It’s a story about a collection of netsuke bought in Paris in the 1870s by Charles Ephrussi, a cousin of the author’s great-grandfather. The book relates the story of these beautiful art objects and the events occurring around them throughout their travels — from Japan to Paris, Vienna, Tokyo, and London, where they eventually wind up in the possession of Mr. de Waal. As you read, you get a sense that Mr. de Waal lived among stories — great and tragic ones. He weaves a strong visual tale of these tiny figures — ivory, horn, boxwood — delicately and intricately carved by Japanese artisans and initially collected by Charles. As an artist himself, Mr. de Waal has a visual capacity to capture the essence of the past beautifully, so the reader is easily able to “see” the places, the rooms, the people, the netsuke, as they move through time. While the lives of the netsukes began in Edo (pre-Tokyo), they enter this story in Paris, in Charles Ephrussi’s study overlooking the rue de Monceau, kept in a black polished wood vitrine lined with dark green velvet and reflected in the mirrored backing. With this story resonating in my mind, I thought it would be interesting to see the places in Paris where Charles lived, and the sites that Mr. de Waal visited in his quest to track the history of the netsuke collection. So we begin where Charles lived after his arrival in Paris from Vienna in 1870, the Hôtel Ephrussi, the family’s home, at 81 rue de Monceau. We arrive at the Parc Monceau and walk through its lovely grounds, stopping occasionally to enjoy the autumn flowers, fantastic variety of trees and beautiful art and installations that make this park unique. 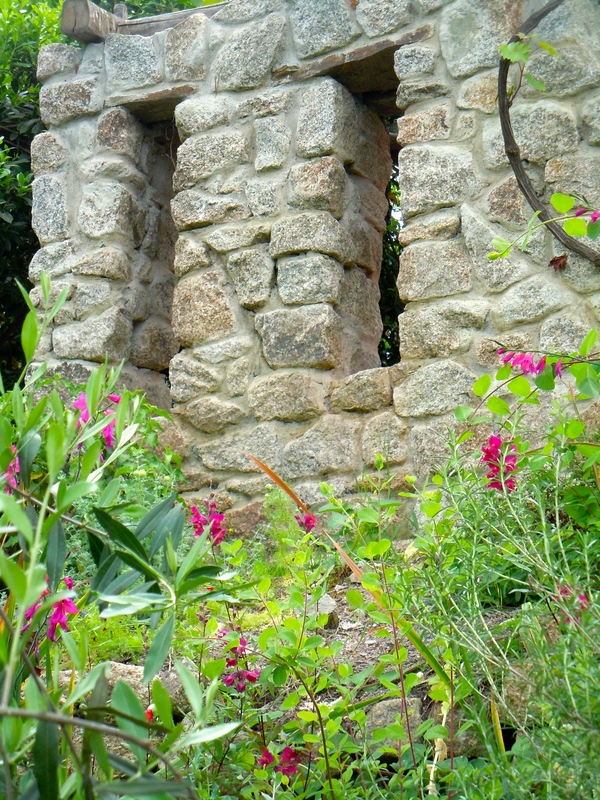 A hillside garden in Parc Monceau. The park was established in the 18th century at the request of the Duke of Chartres, cousin to King Louis XVI. It was unconventional in its tastes at the time with its many conflicting architectural features. Charles was 21 when he arrived in Paris. By that time, the park was undergoing a transformation by Baron Haussmann, opening to the public in 1861. Rue de Monceau is south of the park and we find #81 near the top of the hill. It’s an impressive building, five stories high, with five windows across. Four Corinthian pilasters add a Neo-Classical feel to the façade. Stone urns sit atop the parapet, and the Ephrussi family’s double-Es are still present in the metal grilles over the street windows. The Ephrussi mansion at 81 rue de Monceau. We look up at the second floor windows and envision Charles’ suite of rooms: an antechamber, two salons — one which became his study — a dining room, two bedrooms and a petite chambre. It’s a neighborhood of very impressive homes, once owned by well-known families. With command of a number of languages, a great amount of money and his freedom, Charles spent a good deal of time traveling during his 20s. During his travels, he became a collector — drawings, tapestries, enamels, sculptures and furniture. To get a better sense of Charles and how he lived, Mr. de Waal visited the Musée Nissim de Camondo to view the contemporaneous furnishings in this Museum of Decorative Arts. We, too, visit this museum. Musée de Nissim Camondo from the stairway. We’ve come to see the furnishings of the main house, particularly those in the two drawing rooms. The furniture throughout this beautiful home turned museum has been crafted by artisans who worked for the king and other wealthy clients. Through it, we get a feel for how Charles’ apartment would have been furnished. Meanwhile in Charles’ life, he begins to write a book about Albert Dürer, while also writing for the Gazette des beaux-arts. The Gazette has a reputation as an essential part of society life in Paris. For Charles, it’s “a calling card into those places where society and art intersect.” He’s invited to important salons where he meets poets, playwrights, painters — he begins to find a life for himself in Paris. Mr. de Waal finds that life reflected in the social columns of the day, with Charles and his brothers recorded attending Parisian balls, musical soirées, operas, and receptions for princes and countesses. Charles has new interests … he has a lover and begins collecting Japanese art. The quantities of Japanese art that came into Paris at that time were overwhelming. They arrived at a merchant’s shop and immediately left it. Before the netsukes, Charles had already collected 33 black-and-gold lacquer boxes that he placed among his other treasures. They sat near his Renaissance wall hangings and his pale Donatello sculpture in marble. Charles also developed a growing passion for the work of the Impressionists, creating one of the great early collections of this art. He purchased forty paintings within a three-year period, sending an additional twenty to his cousins in Berlin. His collection included paintings and pastels by Moriset, Cassett, Degas, Manet, Monet, Sisley, Pissarro and Renoir. Following the promotion in a book by Edmond de Goncourt that described the “obsessive search for the perfection” of these tiny sculpted masterpieces, suddenly, it seemed, netsukes had become essential to salon life. And so Charles buys his netsukes — 264 of them. It’s a huge collection of small things, bought as a complete, spectacular collection. A fox with inlaid eyes, in wood. A curled snake on a lotus leaf, in ivory. A hare and the moon. Three toads on a leaf. An octopus. A priest on a horse. A persimmon. And countless others — figures, animals, erotica and creatures from myth. What he does know is that Charles bought a black vitrine to put them in. More than six feet tall with wood polished like lacquer, the vitrine, with its mirrored backing, reflects all the subtle variations in colors of the creams, golds and browns of the ivory, horn and boxwood netsuke. These tiny figures are not shut up in isolation to be viewed. The cabinet is made to be opened, for a netsuke to be chosen, “picked up in a moment of seduction, and encounter between a hand and an object that is electric.” And the netsuke are perfect for the life of Charles’ salon. And Charles’ life is progressing. In 1881, the young poet Jules Laforgue is recommended as a secretary to assist with the lists, notes, and such for the publication of his book on Dürer. And at age 30, Charles becomes the editor of the Gazette. Mr. de Waal, worrying about how he would construct a life out of mere objects is able to feel the room through Laforgue’s writing; he can hear their nighttime conversations and so can the reader of this wonderful book. Charles has become good friends with Marcel Proust and a number of painters of that time. He continues to support the impressionist movement. Charles played a pivotal role as an advocate and an editor. One critic wrote of Charles as ‘an older brother to young artists,’ visiting with them in their studios, purchasing a painting directly from the easel. The book speaks to Charles life, his friendships with the painters, poets and writers of the day and how the “conjunction of Japanese objects and the shimmering new style of painting seems right,” and how this new Japanese art had a profound effect on artists like Manet, Renoir and Degas, who were also avid collectors. Charles even makes it into one of Renoir’s paintings, along with his friend Laforgue. Renoir’s The Boating Party with Charles in top hat in the background. At age 36, Charles becomes the proprietor of the Gazette. It’s 1885, and he’s becoming a public figure. In 1891, Charles moves his netsuke to 11 avenue d’Iéna. The house is larger than the Hôtel Ephrussi and more austere. It’s located on a hill just north of the Champ de Mars, where the Eiffel Tower had just been erected. It was a very desirable neighborhood, referred to as the ‘hill of arts.’ He lives there with his brother Ignace and they give large dinner parties and soirées. Courtyard at the current 11 avenue d’Iena. But Charles appears to grow away from his netsuke. And so ends the Paris section of this remarkable book. Moving to Vienna with the transfer of the netsukes as a wedding gift, the next chapter of this story begins. But this and further parts of this tale are not mine for the retelling. You, the reader, will need to decide if your interest is piqued enough to find out what happens as this most interesting of collections travels through time and the world, interacting, impacting and escaping some of history’s most insidious events. Parc Monceau, at the northern edge of the 8th Arr., was established in the late 18th century by Phillippe d’Orléans, the Duke of Chartres and cousin to King Louis XVI, as a private garden. The park is a favorite of ours and as part of research for an upcoming post on the book, The Hare with Amber Eyes, we visit this park and two museums located at its borders. In 1779, toward the end of the Age of Enlightenment, the Duke of Chartres opened the Parc Monceau, an extravagant pleasure garden. At that time, the park appeared to be a hodgepodge of fantasy focused on various cultures. Among its original installations were a Roman colonnade with a pond, a miniature Egyptian pyramid, a Dutch windmill, a temple of Mars, an Italian vineyard, and other statuary. At its opening, the garden featured exotic animals and servants in flamboyant dress. It was pure fantasy designed to surprise all those who entered. Parc Monceau carousel near the rotunda. The park was purchased by the city of Paris in 1860, and was part of the grand transformation of Paris created by Baron Haussmann. Exotic trees and flowers were planted, enhancing its beauty. Walkways were widened and paved to accommodate carriages and additional walking paths were added. Lush garden in Parc Monceau. The park became a favorite among Parisians, including writers and painters. In the spring of 1871, with the Parc Monceau as inspiration, Claude Monet created a series of three paintings, with two additional ones painted in 1878. We arrive at the park, now considered one of the most elegant gardens in Paris, on a very warm autumn day. We pass through the wrought iron gates embellished with gold located on either side of the rotunda. Rotunda at the entrance of Parc Monceau. The grounds are beautiful with the sunlight illuminating the English-style gardens. Most of the benches located along the walking paths are occupied by Parisians eating lunch, reading or chatting with companions. Scattered throughout the grounds, you’ll find a number of statues of writers and musicians that have been added over the years. Spring photo of the Venetian-style bridge that replaced the Chinese arched bridge. The park is known for its spectacular collection of trees, including a sycamore maple, dating from 1853, with beautifully twisted branches that reach 30 meters in height. Because of the variety and height of the trees, as well as the pond with its large carp and smaller goldfish populations, a great diversity of birds can be found at the Parc Monceau. Colonnade and pond in Parc Monceau. As we meander through the park, we find the great lawn populated with luxuriating Parisians relishing the greens and golds of this sunny mid-October day. Parisians relaxing on the lawn at Parc Monceau. Surrounding the gardens of Parc Monceau are lavish mansions built in the 19th century. The homes seem unaffected by time and the neighborhood is quiet and comfortable. The grand structures are elegant yet unassuming and speak of the wealth and sophistication of that era. Many financiers and bankers lived on the rue de Monceau, which included the palace of Adolphe de Rothschild at #43 with its glass roofed exhibition room that housed his Renaissance art collection. Two mansions adjacent to the park are now museums, including the Camondo family home at #63, and the Cernuschi mansion on avenue Velasquez. The Musée Nissim de Camondo opened in 1935 and presents Moïse de Camondo’s spectacular collection of French decorative arts from the late 18th century. We enter this museum through its beautiful courtyard. In 1911, Moïse had his father’s house razed and construction was begun on his new home, designed in the style of the Petit Trianon at Versailles. Moïse and his children, Nissim and Béatrice, moved into their mansion in 1913; the ‘perfect 18th century setting’ for his collections. Courtyard entrance to Musée Nissim de Camondo. There are three floors accessible by visitors with a restaurant on one side of the courtyard. It’s late in the afternoon and so we go directly into the museum. The lower ground floor houses the kitchen, scullery, chef’s office and the servants’ dining room. We’ve come to see the furnishings of the main house and begin our tour on the upper ground floor. We have access to six rooms including the dining room, two studies, the porcelain room and the pantry. We’re particularly interested in the furnishings contained in the two drawing rooms — the great room that opens onto the garden and the smaller oval salon with its series of pastoral scenes painted by Jean-Baptiste Huet. We imagine what it must have been like during that time period as we walk through these rooms. The Louis XVI-style furniture in the great drawing room comprises a chest of drawers by Jean-Henri Riesener (Marie-Antoinette’s preferred cabinetmaker), a ladies’ writing desk, a suite of seats upholstered in Aubusson tapestry, and a pair of cabinets with Japanese lacquer panels by Adam Weisweller, whose work was often sold to the French court. The Savonnerie carpet in this room was produced in 1678 for the Grande Galerie at the Louvre. In the smaller salon, we find additional Louis XVI-style furniture as well as a folding screen from the games room at Versailles by master cabinetmaker Jean-Baptiste Boulard. On the first floor, we find the two apartments of Moïse and Nissim, plus a drawing room, the library and the bathrooms. The blue drawing room was once Béatrice’s apartments. After she and her family moved out in 1923, Moïse turned the space into a large, light-filled room to be used as a drawing room and study. The wood paneling was originally painted a peacock blue and so the room was called the “Salon Bleu.” Due to age, the paneling now appears to be a shade of green, but the room is beautiful and elegant and includes a series of paintings of Paris, along with eight watercolors from the 1880s by Johan Barthold Jongkind. Of course, the library is my favorite with its wonderful view of the Parc Monceau and its carved wood paneling housing the books collected by the family. The room is rotunda-shaped and located in the center of the private apartments. Moïse’s bedroom contains several pieces dating from the mid-1700s, including the bed and another Savonnerie carpet, which was originally in the chapel at Versailles. There are a number of stamped pieces including a marquetry chest of drawers by Matthieu-Guillaume Cramer and a folding screen by Louis Falconnet. Nissim’s apartment has not been kept as it was, with some of the furnishings moved to the blue drawing room; however, the bed and other historical objects speak to a time when Nissim resided here. The furniture throughout this beautiful home turned museum has been crafted by artisans who worked for the king and other wealthy clients. Shortly after the Camondo’s moved into their new mansion on rue de Monceau, Nissim joined the French Army. It was 1914 and the beginning of the First World War. He transferred to the air force in 1916, was promoted to the rank of lieutenant and subsequently became a pilot. On September 5, 1917, Nissim’s plane was shot down during aerial combat near Emberménil in Lorraine. Moïse’s daughter, Béatrice and her husband Léon Reinach, had two children, Fanny and Bertrand. When the Second World War broke out, the family continued their lives as usual. In 1942, Béatrice, Léon and their children were arrested and interned in Drancy. Léon, Fanny and Bertrand were deported to Auschwitz in November 1943. Béatrice was deported in March 1944. None of them survived. As for Moïse, he never quite recovered from his son’s tragic death. He closed down the family’s bank and his life was never the same. Rare visitors were either close friends or scholars. His home and collections were bequeathed to the French state in Nissim’s memory upon Moïse’s death in 1935. Located at 7 avenue Velasquez at the east entrance to the Parc Monceau, you’ll find the Musée Cernuschi, or Museum of the Asian arts of Paris. Henri Cernuschi was an Italian patriot and one of three heroes who liberated Milan from Austrian occupation in 1848. He fled to Paris after the fall of the Roman Republic and eventually built his reputation as an economist. From 1871 to 1873, Henri and his friend, Théodore Duret, a young art critic, traveled to Japan and China where he acquired a collection of about 5,000 works of art. Upon his return to Paris, Henri built his home on the Parc Monceau, a private neoclassical-style mansion where you can see mosaic medallions of Aristotle and Leonardo da Vinci on its façade. Upon entering the museum, one is immediately taken with its high ceilings and windows that look out onto the park. A great bronze Buddha, acquired in Japan, dominates the room. As you move through the space, you’re able to follow Henri and Théodore’s journey through China and Japan from the plaques arranged on the friezes at ceiling level. This passion for Asian art made Henri’s mansion a center of activity from 1876 to 1896. Since its opening in 1898, the museum has acquired additional objects including archaeological pieces discovered in the mid-20th century in China and Vietnam. Throughout the years, the museum has hosted major exhibitions of works from China and enjoys close associations with Asian artists active in Paris. There are currently about 12,500 art and archaeology objects in the collection with about 900 on permanent exhibit in the museum. The collection includes pottery, jade, ivory, bronzes and statues. A collection of contemporary paintings and photographs can also be viewed. Henri bequeathed his mansion and Asian collections to the City of Paris in 1896. These fascinating museums, along with a stroll through Parc Monceau, are perfect for a beautiful, sunny October day. As the days fall away, so too do the leaves of autumn. Relaxing mornings spent with strong coffee and fresh, flaky, buttery croissants heated in the oven and pulled apart to top with marmalade have been our norm since arriving in Paris in early October. But on a day that’s destined to be the warmest so far (79F/26C), we venture out as the sun’s rays touch the white stone architecture of the city and Paris awakens. The streets are still damp from the coolness of the evening and the softness of the morning light creates a sense of newness. Thom, Eric and I are off to Le Pure Café in the 11th Arr. It’s a lovely morning for a walk and we find some wonderful cobblestone streets with interesting restaurants and shops that beg us to take short detours. Not too far from the Place de la Bastille at 14 Rue Jean-Macé, Le Pure Café is situated away from the hustle and bustle of traffic, yet well positioned on a corner between two side streets. A series of proprietors have maintained its 1930s vintage decor where you can sit at an outdoor table or find a cozy spot inside. The ambience, with its old-fashioned signboard, flare lamps and mosaic tiles pulls you back to a previous time in Paris. The rather distinguished zinc bar would be a nice place to sit with a glass of wine. On this day, we take a table inside and discover that they don’t actually serve breakfast. However, they have one croissant and one tartine that we’re able to purchase. We decide it was probably the breakfast set aside for the waiter, who may actually be the proprietor, as he appears to be the only worker in the café. The coffee is good and we’re thankful for the small bite that we share between the three of us. A gentleman sits at the counter, his small, white Lasa sits atop, its head sticking out of a black carrying case as he closely watches the activity taking place around him. Other customers sip coffee and read newspapers, books, or chat amiably with their companions. The location and the café’s vibe has been a draw for the film industry as well. It’s been featured in the French films Le code a changé and Les Infidèles, but possibly the most famous example is Before Sunset, where Julie Delpy and Ethan Hawke’s Parisian time together is brought to an end. At our end, we decide to wander the area around the Bastille. We had wanted to go underground into the Bastille’s crypt, however, as we’ve discovered on several occasions during this visit, it, too, is in the midst of renovation with a 2020 scheduled opening. Meandering through the streets, we find some lovely back streets and come out in the 12th Arr near the Viaduc des Arts. The viaduct, located just east of the Opéra Bastille, was built in the 19th century to support the Paris / Bastille-Varenne railway line inaugurated in 1859 and closed a century later with the opening of the RER A. Between 1990 and 2000, the vaults of the viaduct were restored as arts and crafts studios and shops. There are more than 50 artisans located here creating and presenting their designs in support of innovation and creativity. You’ll find restaurants as well as workshops, showrooms, shops and galleries. Above the Viaduc des Arts, along the old railway, sits the Promenade Plantée also known as the Coulée verte René-Dumont. This nearly three mile elevated park opened in 1993. The Promenade Plantée also appears in the film Before Sunset. Since breakfast was slight, after perusing the shops, we decide to stop at a boulangerie for sandwiches and an impromptu picnic above the city. The trees have grown substantially since our last visit here in 2014. It was a lovely day as the lavish brush of autumn continues to color the city. The weather has remained very warm for this October with only one day of rain. We’re taking advantage of this with long walks through the beautiful neighborhoods of Paris. April in Paris is a remarkable time when new leaves are coming out and the spring sunshine begins to lure the flowers from their sleep. As the days brighten and the rain comes, warmer days beckon you outdoors and into parks and walking paths. October is like April in reverse. Flowers are blooming, although the variety has changed. The leaves on the trees are darker and older and are thinking about their upcoming change. Walking through the streets of Paris, you see the shadows lengthen and wish you’d have thought to bring a hat or a scarf to fend off the chill. Then you stop for lunch at a sidewalk café and by mid-afternoon you’re thinking of taking off your jacket. With a month in front of us, and many visits to Paris behind us, we focus on destinations not listed in visitor guides. We talk to locals about where they shop and places they love to help us determine out-of-the-way locations. We’ve chosen a flat in the 10th Arr, three blocks northwest of the Place de la République. It places us north of the main tourist sites and further into local territory. We’re shopping at markets and stopping at cafés where fewer workers speak English. It provides us with an excellent opportunity to improve our French. Our first major food shopping excursion takes us to the Marché Saint Quinten just off of Bd Magenta where vegetables for the week cost us €11,20. On a warm sunny day during the early part of our visit, we set out for the Canal Saint Martin, located just a few short blocks from our flat. This early 19th century waterway was ordered by Napoleon I to supply Paris with fresh water. Canal boats also brought freight as well as food into the city. The canal links the Seine, just behind Notre-Dame cathedral and ends at the Parc de la Villette. The street that runs along the canal is lined with Chestnut trees, and elegant footbridges enable you to cross over to the other side. Locks are present where needed to allow the boats to traverse beneath the cast iron footbridges. Cafés, art galleries, boutiques and funky shops line the streets on the western bank of the canal, although not too many tourists can be found. Mallards swim casually through the water as people sit alongside reading books or eating lunch. We stop at La Grisette, a lovely little café for escargots and pizza. You may think this an odd choice, but my friends from Taiwan don’t have many opportunities to enjoy pizza, so that’s our lunch on this fine day. If you cross over to the east side, you can follow Avenue Richerand to the Hôpital St Louis. Erected in the 17th century to house plague victims in isolation from the rest of the city, it has a lovely, large and elegant square hidden on the grounds. We take advantage of the detour and discover that the square is hidden quite well. Being a rather formidable hospital, it takes us awhile just to find an open entrance to the grounds. But we persevere and eventually find our way inside the square with its wonderful large, old trees and beautiful circular garden in the center. Rather nice, actually. Of course, there are always favorite places in Paris that we just can’t miss. Located in the 13th Arr a short walk down Rue Bobillot from the Place d’Italie, this area used to be a separate village outside of Paris. Cobblestone streets and smaller private homes with modest gardens offer a less urban feel in an area more intimate in scale. We stop first at one of my favorite Paris jewelry shops, L’Argenterie (5 Rue de la Butte aux Cailles) before heading to Chez Gladines (30 Rue des cinq Diamants) for a wonderful Basque-style lunch. Other restaurants along Rue de la Butte aux Cailles include Le Temps des Cerises, an old-fashioned workers’ co-op popular with the locals at #18 and at #13, you’ll find the Taverne de la Butte as well as Des Crêpes et des Cailles. As you wander through this village-like setting, make sure you head down the cobblestone passage Barrault off of Rue des cinq Diamants and turn right at the end heading up to Bd Auguste Blanqui to the outdoor market with its tempting array of produce, cheese and other traditional French fare. The market is open on Tuesday, Friday and Sunday. There are several places in the 5th Arr on our list to visit during this trip. On a beautiful, sunny afternoon, we walk from the Place de la République down the Bd du Temple into the Marais. We’re interested in visiting the Musée Carnavalet, listed as the “oldest of the municipal museums” and containing the historical legacy of Paris. While essentially a history museum, we’ve read information about it that states that it’s an art gallery exhibiting mostly original works “in keeping with the genius of Paris.” With beautiful gardens and rooms filled with historical furnishings, the Musée Carnavalet sounds like a wonderful stop on a sunny afternoon. Perhaps, though, we should have checked their website before walking here, as the museum, located in two town houses, is currently in the midst of a major renovation that will not be completed until the end of 2019. So, we shall keep it on our list for a future visit. Not to be deterred, we continue on in our quest to view other places in this area previously not seen. Walking further, we stop along Rue Francois-Miron in front of two of the oldest houses in Paris. The buildings, constructed in the 14th century are half-timbered former inns. In this city of stone, they are rather remarkable in their uniqueness. A short walk later, we arrive at the Musée des Arts et Métiers, a rather amazing and very large museum partly housed in a very old church complete with stained glass windows. Dedicated to technological achievements, scientific instruments and industrial design, complete with renditions of famous bridges, automobiles, computers, cameras and the like, the vast quantity of objects makes for a fascinating tour. In the church, there’s a bi-plane hanging from the ceiling of the dome and a Foucault Pendulum swinging slowly in the entranceway demonstrating the rotation of the Earth. October is proving to be a lovely time of year in Paris. The temperatures have been cool in the mornings and in the low to mid-70s by mid-afternoon. The trees are just beginning to change and it’s a wonderful time to walk around the city. Spring came early in western North Carolina before winter, in its final throes of the season, took back control. The blossoms of spring were unsure about timing, but at the North Carolina Arboretum, you can find beauty in any season. 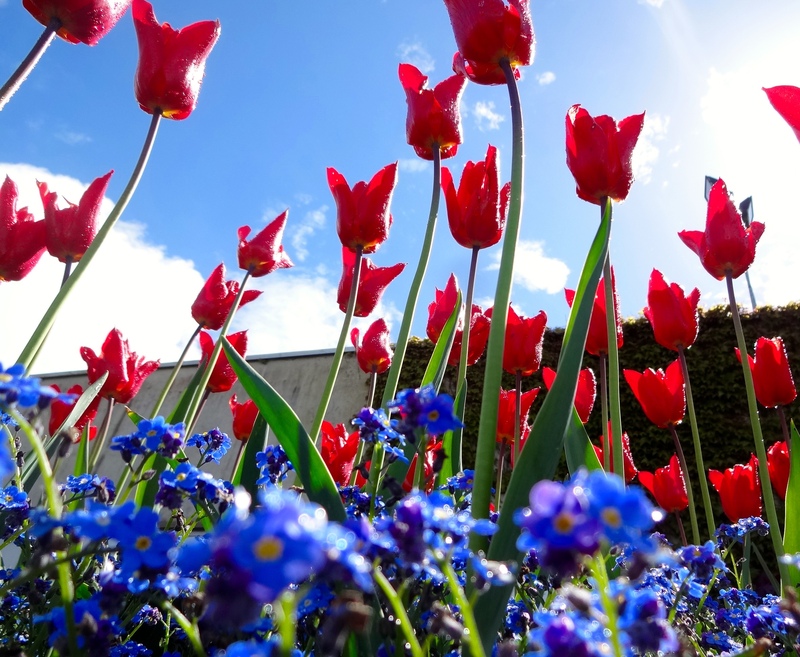 This spring finds many activities designed to get you out of the house and back into nature! The grounds are replete with hiking and biking trails, gardens, exhibits at the Education Center and the Baker Exhibit Center and Greenhouse (as well as in the gardens themselves), and a myriad of events for all ages. The NC Arboretum was established in 1986 and is an affiliate campus of the University of North Carolina. The 434-acre public garden is located just south of Asheville inside the Pisgah National Forest, one of the most beautiful natural settings in America. With its forested coves and meandering creeks, its beauty speaks to our very soul. The NC Arboretum includes 60 acres of cultivated gardens and more than 10 miles of groomed hiking and biking trails. Events bring the outdoors inside and change throughout the year. Spring is an exciting time at the Arboretum, with its seasonal landscape garden exhibits that run from April through October. It’s also a particularly beautiful time of year with the amazing colors of springtime in the ever-changing variety of spring flowers and the budding new leaves. The Arboretum provides innovative educational activities and events throughout the year, but spring is one of the busiest seasons. The Arboretum is host to the Annual Rhododendron & Azalea Flower Show. The judged event features hundreds of Rhododendron and Azalea blooms and also features guided trail walks, which takes you along Bent Creek to the Azalea Garden to view the Arboretum’s National Native Azalea Collection. Naturally, environmental issues are a concern and this season the Arboretum is focusing on butterflies in its continuing effort to raise awareness for pollinators. Its seasonal garden exhibits feature many plants and flowers that attract and support butterflies, and its signature Quilt Garden is designed in a butterfly quilt block pattern. The Forest Meadow garden has added several new butterfly-focused plantings and includes interpretive signage about butterflies and other pollinators. New this year and continuing throughout the summer, you can see the “miracle of metamorphosis” in the Baker Exhibit Center Greenhouse. Winged Wonders is an indoor butterfly experience featuring a butterfly nursery and walk-through butterfly house where a variety of local species, including monarchs and swallowtails fly free. The Arboretum is also host to the annual World Bonsai Day, an internationally celebrated event dedicated to furthering bonsai awareness and appreciation world-wide. With a beautiful bonsai garden located on the grounds, you can always see a full collection of these amazing miniature trees and plants. Throughout the year, the Baker Exhibit Center features works by local and regional artists. This year’s featured artist is painter and papermaker Elizabeth Ellison. Ms Ellison utilizes both traditional and oriental techniques, and often employs American Indian motifs, to depict the varied wildflowers, animals, human inhabitants and landscapes of the Smokies region and beyond. She frequently gathers and processes native Appalachian plants to make the handmade papers she incorporates into her paintings. A native of Milton NC, Ms Ellison is of Occaneechi Indian descent. In addition to the exhibits and events, many people come to hike or bike the trails, which are designed for all ages and ability levels. Trail options include easy, moderate and difficult levels and are dog-friendly. From the many trails within the Arboretum, hikers have access to other areas such as Lake Powhatan, the Pisgah National Forest and the Blue Ridge Parkway. The term Arboretum was coined by landscape gardener and writer John Loudon in 1833, but the establishment of botanically significant collections dates back to the Egyptian Pharaohs. Intended for scientific study, one of the main aims of Arboretums is to conserve native and indigenous trees. The NC Arboretum is part of the Bent Creek Experimental Forest, a system of 80 Experimental Forests and Ranges that are administered by the US Department of Agriculture Forest Service. The system provides opportunities for long-term science and management studies, which supplies a wealth of data and knowledge of environmental changes in both natural and managed forest and rangeland ecosystems throughout the US. As part of the Experimental Forest system, the NC Arboretum supports ecosystem research and helps the Forest Service and other entities meet current and future conservation challenges through the synthesis of data. Over the years, many major discoveries have resulted from the research collected from Experimental Forests and Ranges. For example, based on long-term precipitation chemistry data at a New Hampshire Experimental Forest, scientists were able to recognize the effects of acid rain on vegetation. And, in the Pacific Northwest, research helped set the stage for conservation planning for the northern spotted owl. Nearly a century before the NC Arboretum was founded, Frederick Law Olmsted, considered the father of American landscape architecture, was in the process of designing the grounds and gardens for George Vanderbilt II’s country estate. During that time, Mr Olmsted envisioned a research arboretum as part of his legacy and plan for the Biltmore Estate, which was the first professionally managed forest in the US. The Arboretum is open to the public with spring and summer (April through October) hours from 8 AM – 9 PM, with the entrance gate closing at 8 PM. The Bonsai Exhibition Garden is open from 9 AM – 5 PM daily. Cornwall in Springtime is just waking up from its Winter nap. Spring flowers are blooming, trees are budding and gardens, nourished from the rain, are bursting forth in all their color and English garden glory. England is not unlike other industrialized countries when it comes to tapping the Earth for its wealth of rocks, minerals or other substances of which humans can’t seem to get enough. And similarly, leaving behind the desolation and destruction so often associated with quarries or mining. But the Eden Project shows us that the Earth’s scars can be healed. And so on a typical blustery, English day, Mark Stine and I climb into my cousin Derek’s car and with his wife, Cathy, drive the nearly 50 miles from Penzance to Bodelva, Cornwall. 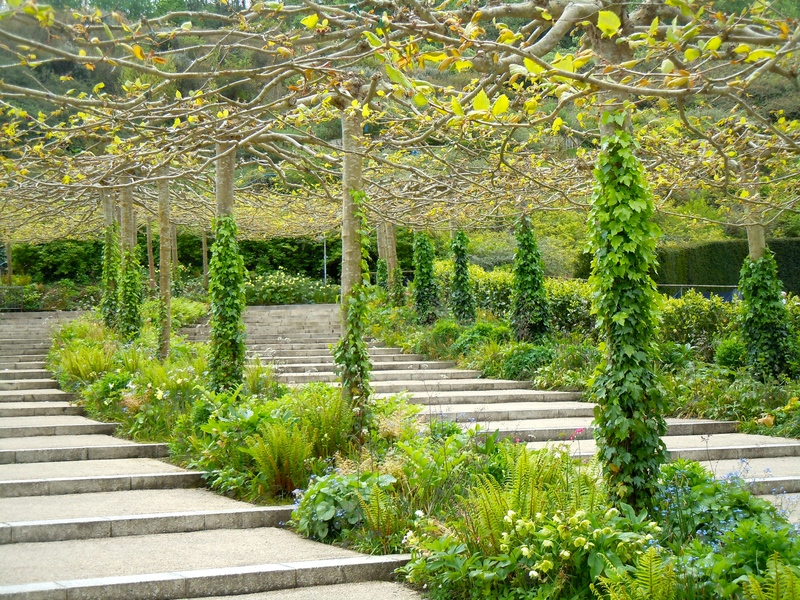 The Eden Project was envisioned about 15 years ago by Sir Timothy Bartel Smit after he and his colleagues had completed the restoration of the Lost Gardens of Heligan, also in Cornwall. 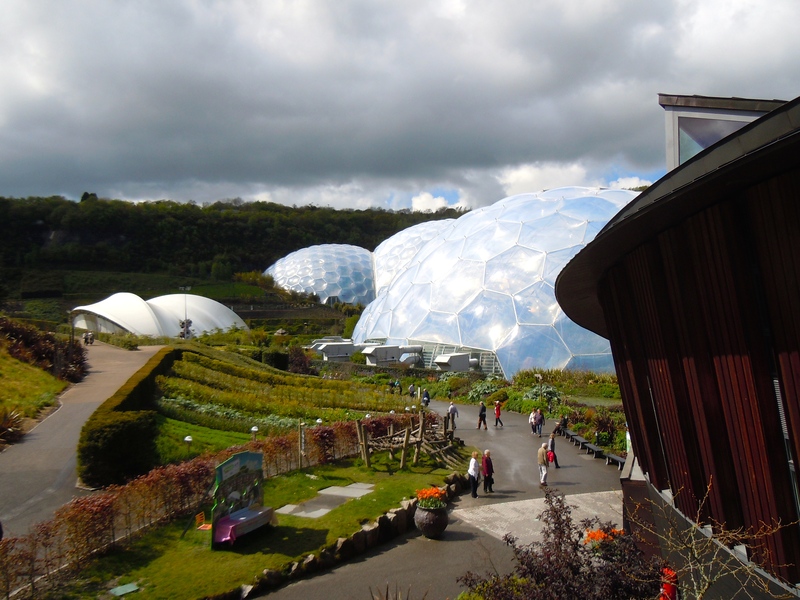 Turning their eye to an old China clay pit near St. Austell, the Eden Project was born to prove that when the land is so violated, it can still recover. And in Eden, it’s been brought back with incomparable success. Upon entering the site, you are struck by the futuristic nature of the giant white pods, called biomes (or eco domes), that serve as the greenhouses. They sit within a theatre of land carved out of the hillside. Walking out onto a viewing platform, you can see the gardens and pathways that will take you to the pods that look other-worldly. Walking along the pathways, you can almost hear a sighing as this new, positive energy revitalizes the land. 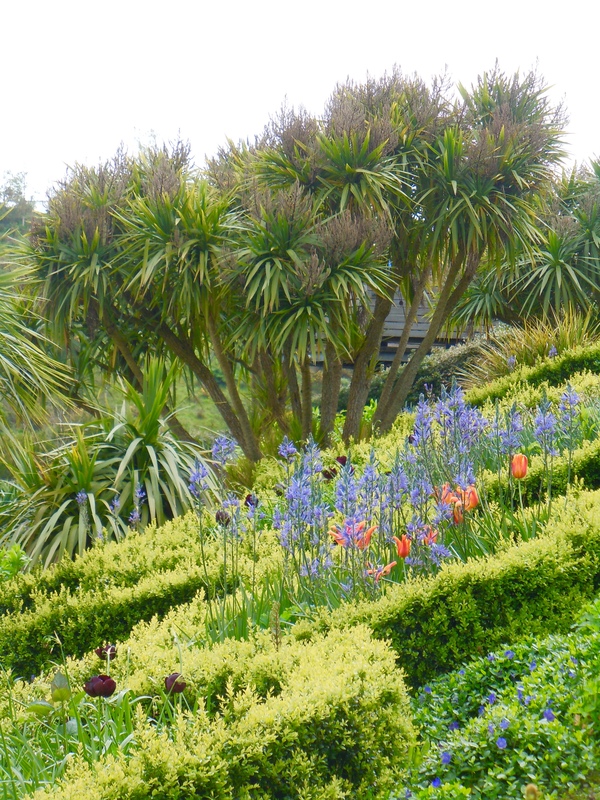 The beds of flowers sway in the breeze, weaving from one color to the next in a masterpiece of botanical artistry. 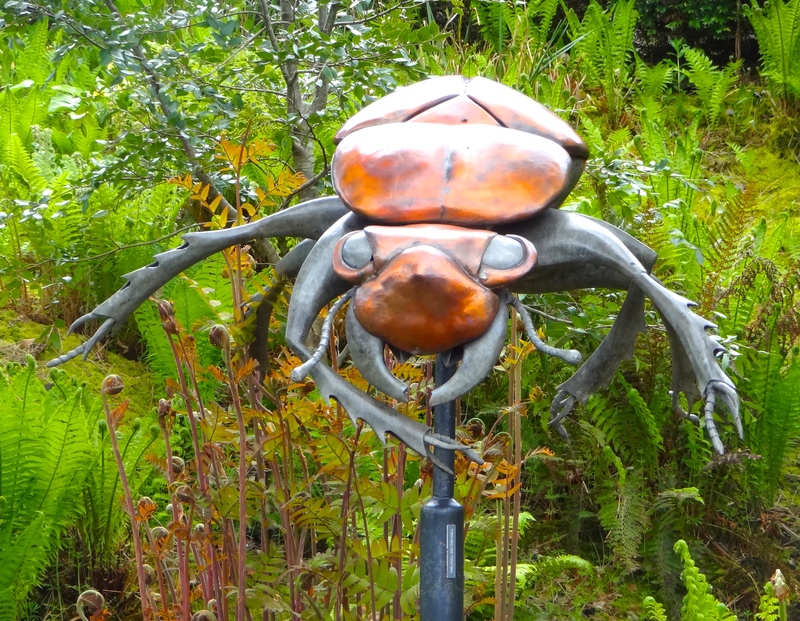 Sculptures are scattered throughout supporting the theme of a garden dependent on individual aspects of the cycle of life — a large ant, a shiny beetle, a fuzzy bee — all important pollinators and indicative of a healthy environment. There are two greenhouses, one that contains tropical plants and a rainforest that gets more hot and humid the further up you climb. The other takes you on a walk from the Mediterranean Basin to California (the Horn of Plenty), and from America’s desert Southwest to the hills of Tuscany, with appropriate flowers, plants and ground cover to match. From its conception in 1995, through the final funding in 2000 and onward through its creation (the Big Build) and opening in Spring 2001, the group has been focused on organic sustainability and education. As the sign in the entryway says, “Eden was built in an old clay pit to demonstrate regeneration, the art of the possible and … hope.” With a desire to “inspire people to connect with our natural world” Tim Smit and his team brought a desolate, all but exhausted quarry back to the garden. This is a place of peace and beauty that is well worth the trip should you find yourself in the glorious countryside of Cornwall.